This week (19th September) has marked horrible protesting at Wits. In fact the Great Hall in which I have graduated three times was defaced. I did not take kindly to this. Nor did I take kindly to the fact that chairs built by Wits architectural students were set alight. I was also not impressed by the finding of three petrol bombs on campus. The situation is dire, and what is the government’s solution – passing the buck to the Universities. Good luck Wits- you find a solution to the war on your doorstep. I am from a privileged background; however I do not think that this negates my opinion. I feel silenced and unwelcome in my own university and so does a large majority of students. In a poll last week, 70% of students voted to reopen the university. The SRC is acting largely on behalf of a section of students that feel it is less important to come up with a viable solution (a process that will take years) and more important to protest the injustice (because, yes, the system is unjust). But let’s face it: whether the system is fair or not, we still all want to graduate. Can’t we work on a solution while still building on our individual futures? I have had many debates about this topic in the last month. My go-to story is one I will now relay here: in my third and final year of undergrad I could not secure any kind of funding to pay the university. The banks were treating me as if I was Richie Rich and my parents too rich to fit into the NSFAS scheme. I was also in the top 5 of undergrads in my course. How can it be that no help can be given and no scholarships were readily available to a top student? The system is intensely flawed. However the radical solution of free education is just not a desirable one with the economy as it is. Books, machinery and lecturers are getting more and more expensive and quite frankly, the universities can’t cope anyway. We don’t go into Exclusive Books, see a book we’ve wanted for ages, and demand that it should be free because the price has gone up too much for our liking. Tertiary education is not a right, it is a privilege, and that is the case in all third world countries. Yes, our country still faces huge racial inequalities, but the challenge of funding higher education is not primarily a race-biased issue. In fact, here is a disturbing statistic: South Africa only spends 0.71% of its GDP on education, compared to 3% that China spends. But even worse: what good is free tertiary education if the majority of students are not equipped to handle the work load? 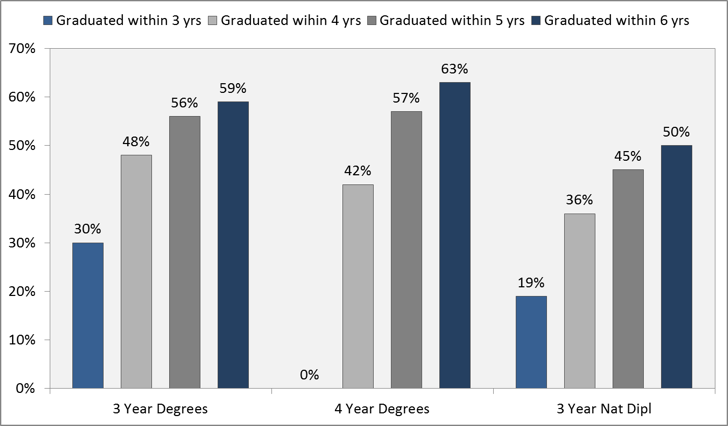 I was horrified by this graph from the CHET and DET cohort studies showing students that started university in 2008 (the year I started): only 30% of students actually finish a 3-year Bachelor’s degree within 3 years. This already tells us something – our basic and secondary education is not reaching the people it needs to. The entire issue can be summarised as a “…highly unequal schooling system where access to high-quality schooling largely depends on a family’s ability to pay school fees,” eloquently put by Nic Spaull in his fantastic blog. This class divide happens to be along racial lines as well, thanks to that constant burden, Apartheid. 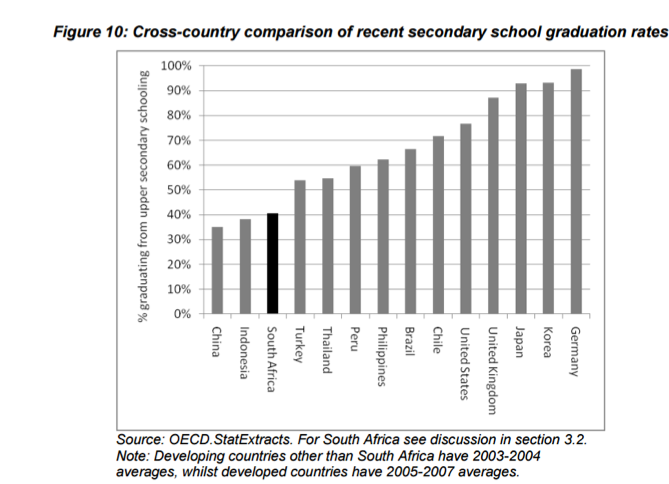 60% of White matric students achieved 60% or more in matric; only 5% of Black African matrics score at or above 60%. Good secondary education is still not accessible to most people: of the 1 million kids who enter Grade 1, only 100 000 will enter university, and 53 000 will graduate after 6 years (Van den Berg, 2015). This government has to start feeding money into making the best schools into practical models for the rest of the country. Teaching is not an easy job and should not be the easiest degree to get into (requiring only E’s) and these human heroes need to be paid adequately. Being a teacher needs to be a high-status job, and paid as such: our country’s future depends on the motivation levels and quality of our educators. For now, a potential solution may be to make correspondence schools like UNISA free, where there are no additional living costs attached to the student. Basic education is a right. Why is no one fighting for that??? We can put plasters on gaping wounds but at some point it will need surgery. Maybe soon, we will have a president that can read the budget, and things will improve. But then again, he also suffered from a lack of basic education.